"Meet Vance Muse, the racist political operative and Texas lobbyist who pioneered the 'right to work' movement that’s still assaulting Americans to this day. "Muse, like all Republican operatives, appealed to the worst aspects of the human condition (racism) to 'divide and conquer' the working class... and, like all Republicans, besides being a greed-centered ghoul contributing nothing but pain to society, Muse, who lobbied against women's suffrage, FOR child labor laws and against the against the 8-hour workday, was always on the wrong side of history. "The 'right-to-work' movement to destroy labor unions began almost as soon as FDR passed the Wagner Act in the mid-1930s, which gave labor organizers 'union security' as the old euphemism went and should still go. Again, you have to understand the historical context: Until the Wagner Act passed, when it came to workers’ rights, America in the 1930s was about half a century or more behind the rest of the West — child labor wasn’t even outlawed here until 1938." "...and Republican fascists want to drag us back to the Gilded Age. We must educate our fellows, STOP the Class War against working people and re-instate the Wagner Act. 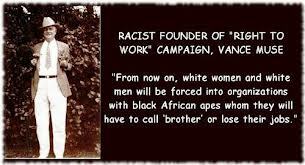 "From now on, white women and white men will be forced into organizations with black African apes whom they will have to call ‘brother’ or lose their jobs." "The Michigan GOP apparently blindsided everyone with the union-busting 'right to work' laws they just rammed through the state. Certainly my labor friends were caught off-guard tactically by the Republicans’ speed and choice of battleground. "For most of the county, though, the confusion has to do with what 'right to work laws' are and why they’re so bad. You can see it written on the faces of the morning cable news hosts on CNN and even MSNBC — trying to pretend like they know what "right-to-work" laws actually mean, flummoxed by the brazen Orwellian neologism of the phrase and sweating over the possibility that they might have to explain it. Lucky for them, and for most of the media establishment (and for the Koch brothers), few people even know what questions to ask about 'right to work laws.' All they know — kinda — is that they’re bad for unions, and that those unions seem to know exactly how bad things are about to get. "That’s until you start to understand the history of the 'right to work' movement, the racist human hagfish who brought 'right to work' into our lexicon and made it happen, and the far-right fascist oligarchs who made it worth their while. 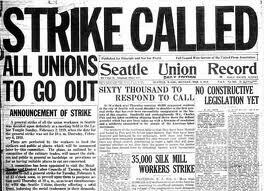 "By 1930, labor unions were practically dead, considered a relic of the past by the media and academic elites. The Great Depression changed all that, in part because unlike today, back then Americans had no food stamps, no unemployment insurance, no state pensions, and of course, no child labor laws and no labor protections to speak of — all the things labor unions are responsible for giving us today. In terms of understanding what just happened, it would help if we were back in the 1940s and 50s, when most liberals and establishment media used — and understood — the antonym, "union security" — a descriptive phrase for the New Deal labor laws which finally gave union organizers a fighting chance, and saw the percentage of unionized workers in the US soar from single digits in the early 1930s to around 35% of the workforce by the mid-late 1940s. The "right-to-work" movement to destroy labor unions began almost as soon as FDR passed the Wagner Act in the mid-1930s, which gave labor organizers "union security" as the old euphemism went and should still go. Again, you have to understand the historical context: Until the Wagner Act passed, when it came to workers’ rights, America in the 1930s was about half a century or more behind the rest of the West — child labor wasn’t even outlawed here until 1938. But nothing compared to the endless massacres and murders of American labor organizers, massacres that are all but censored from the official history of this country. Maybe you’ve heard something about the Ludlow Massacre of the families of mine workers at Rockefeller’s mines in Colorado in 1913 — but you probably don’t know many of the details, like how Rockefeller’s private armed goons patrolled the miners’ miserable tent cities in an armored car with a mounted machine gun, spraying the tents and terrorizing the strikers, who demanded such radical concessions as "enforcement of Colorado’s laws," the eight hour work week, and pay for time spent working. Or how the terrorized women and children in the embattled tent city dug a giant makeshift bunker pit beneath one of the larger tents to hide out from the bullets — only to have Colorado National Guardsmen douse the tents with kerosene and light them on fire while the miners’ families were sleeping, then shoot some of those who ran out, killing over a dozen children, scores of workers and their wives, and ending with the arrests of hundreds of miners. In the end, anywhere from several dozen to 200 were left dead. We don’t know exactly — and there hasn’t been much effort on the part of our culture to find out. This "we don’t know the death toll" marks just about all of the many killings and massacres of labor organizers and strikers in the pre-New Deal era. "From the Ford Motors massacre in Michigan in 1932, which left four workers killed and up to 50 wounded — through the Chicago Memorial Day Massacre of striking Republic Steel workers in 1937, in which company thugs and cops killed 10 peaceful marchers nearly all of whom were shot in the back, and wounded 60 more, billyclubbing the wounded as they crouched in the dirt — America was a savage and violent place to work if you weren’t rich. 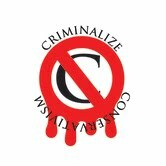 "Hearings were held in the Senate, and the LaFollette Committee Report discovered that corporations not only operated armies of spies in the tens of thousands, but that 'Republic Steel Corporation [responsible for the 1937 massacre] has a uniformed police force of nearly 400 men whom it was equipped not only with revolvers, rifles, and shotguns, but also with more tear and sickening gas and gas equipment than has been purchased...by any law-enforcement body, local, State or Federal in the country. It has loosed its guards, thus armed, to shoot down citizens on the streets and highways,' the Senate report observed. "That was the arsenal controlled by just a single steel company. "FDR leveled the workplace playing field some with the Wagner Act, for the first time making union security (closed shop) a reality. 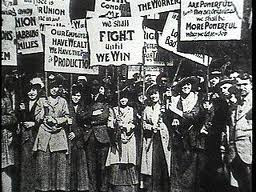 Labor union power and membership soared, as did wages and benefits; America suddenly had Social Security and unemployment insurance, child labor laws, a minimum wage, five day/40 hour work week, and within a few years, a powerful middle class. "To big business plutocrats, the New Deal labor laws represented a sort of political Holocaust that they never forgot or forgave. They lost their full spectrum political dominance over their workers and over the political and judicial direction of the country, and all that essentially because FDR brought to an end America’s 'open shop' culture and empowered unions with 'closed shop' union security. "But business vowed that one day it would have its revenge. And that revenge would be 'right to work' laws. "So there we are, with tear gas flying in Michigan...and busting unions, and the words 'right to work' on every front page from here to London, we’ve come full circle.,.It’s looking like if we want to get out, folks, we’ll have to fight our way out." For those who say it can't happen here, or even it can't happen here again - it did happen here, and the old maxim that those who ignore history are doomed to repeat it is apropos. The Conservatives of today are no different than those of yesterday. The destruction of the unions is as overt today as they were in days not long ago when Reagan started the modern movement to eradicate organized labor. They have the power, the money, their tamed legislatures, and the will - and they are still trying to thrust our country back to the days of ultimate power for the rich and the enslavement of the working men and women of this country.